Decorative Wood Corbels and wooden brackets add elegance and beauty to any home renovation project and come in many styles and sizes. 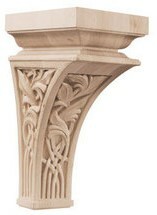 Popular corbel styles include Acanthus, Acorn, Corinthian, Fluted, Grape, Leaf, Mission, Scroll, Lion, Floral, Art Nouveau, Art Deco, Gaelic, Celtic, Fleur-de-Lis, Romanesque, and more. 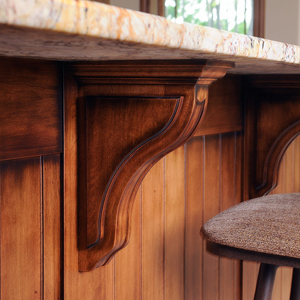 Corbels also are available in a number of wood species: Alder, Aspen, Cherry, Maple, Oak, and Rubberwood. (2) the sort of load it is going to be carrying. 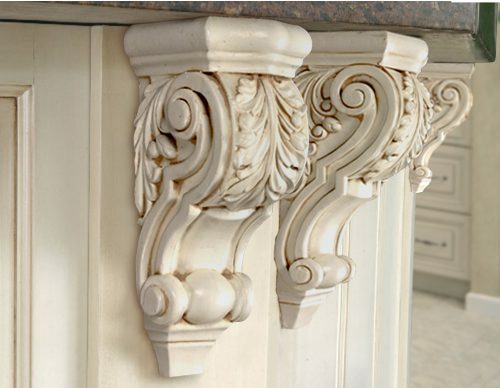 The easiest and more common method is to hang the corbel if the overall weight is not too heavy. Hard mounting with screws or bolts will be necessary if the corbel or bracket is providing significant support for the structure. When choosing screws, you will want to select a screw with a head size that the slot will accommodate. The length of the screw will be determined by the surface you are affixing the corbel to and by the weight you need to support. Anchors may be necessary if you will be hanging the corbels in sheet rock and there are no wall studs in the area you will hang the corbel. 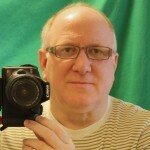 Hard mounting has its obvious advantages and can be done from the front or back. 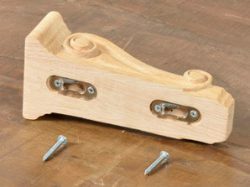 To mount the corbels from behind, use multiple screws or bolts that are long enough to enter the corbel but not so long as to go all the way through the corbel. If you can’t attach a corbel from the back, a front mount is required. You can simply screw into the front of the corbel and cover the screw heads with putty and sand. Be aware of what you are screwing into and make sure you are going at least 1 1/2″ into the mounting surface. Use enough screws to keep the corbel firmly in place. You may also use wood glue along with the screws when hard mounting, however, this can ruin your surface if you ever have to remove the corbel.